This year, Sugarloaf Fine Arts Camp was home to over 200 campers who traded their phone, tablet, and TV for instruments, cameras, and paintbrushes. For one week, campers explored the arts and enjoyed the surrounding environment of fresh air and pine trees. Campers, ranging from sixth to twelfth grade, spent an average of three and a half hours a day in their major subjects and a little over an hour a day with their elective selections. The remainder of the day was spent attending camp-wide assemblies, campfires and structured downtime with a range of possible activities. Campers are supervised and supported by camp staff and counselors. Sugarloaf’s staff come from all over the country to spend a week with the campers. Much of the staff have been working at Sugarloaf for many years, even taking time off work to come to camp. “It shows that people make this a priority, and they want to come back every year,” said Laura Herriot, Camp Secretary. Fellow counselor, Stephanie Lemon, attended for two years as a camper and is currently in her fourth year as a counselor. Ms. Lemon explained that Sugarloaf is special to her because “It’s a safe place and all my friends are here. There's a lot of love.” Camp counselors work hard to provide a fun and supportive experience for campers throughout the week. 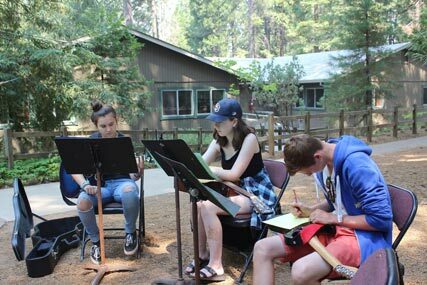 Sugarloaf Fine Arts Camp occurs annually at the Sly Park Conservation and Education Center in Pollock Pines. The two week-long sessions run from middle to late July and feature different majors and electives during each session. Examples of majors are Music, Dance, Photography, Textile Arts, Theater, Visual Arts, and Vocal Arts. Available electives include Acoustic Guitar, Crafts, Musical Theater, Playwriting, Tap, and Ukulele. For more information, please see the camp website.